Installing Spark from the Universe is possible via either the DC/OS GUI or the using the DCOS Package installer from the command line. The following sections describe in detail some of the different Spark framework installation options available. 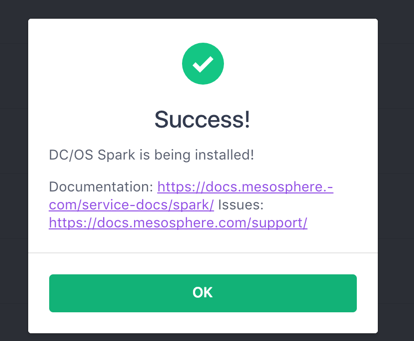 Installing the GUI is by far the easiest way to quickly deploy the latest Mesosphere supported Spark version to your DC/OS cluster. Selecting the 'Universe' option from the left side menu then clicking 'Packages' provides a full list of available DC/OS frameworks to your cluster. To facilitate location of the Spark framework to install, just type 'spark' in the search input box at the top of the screen. This will display a list of all DC/OS framework packages affiliated with Spark in some way. For our example, we will select the first package titled 'spark'. For this example we are going to just accept the default Spark framework configuratons as that is sufficient for most initial Spark program executions. Though as you get more comfortable with Spark on DC/OS you will want to explore the 'Advanced Installation' options to configure power features such as Kerberos, DC/OS Roles and default container images among a few of the more commonly used configuration options. After clicking the 'INSTALL PACKAGE' button from the screen above, very quickly afterwards you will see a SUCCESS message with details on how to get more information about the framework. Make a point to copy and save the URL presented here for future reference. The Spark Framework is not quite yet able to receive your spark programs for execution, as the framework is going through a validation and deployment process. If the Spark framework cycles between 'deploying' and 'waiting' that is probably an indicator that you have a Spark Framework configuration problem or insufficient resources (But, for this example, everything should be fine) for the framework deployment. We can tell by the diagram above that the Spark Framework was successfully deployed as for the Spark service name the status is green and we can see that it is running 1 instance. While the GUI Universe package installation option provides an easy way to setup services such as Spark within DC/OS, a more powerful tool for installations is the Command Line Interface (CLI). Using the CLI to install packages makes it easier to quickly setup services via bash scripts. 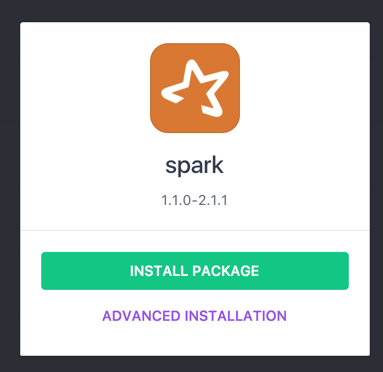 Unlike package installation using the GUI, using that the COS command line package install option installs both the spark package as well as at CLI in one step as shown below. DC/OS Spark is being installed! You now have a fully functional Spark instance named /acctngspark.